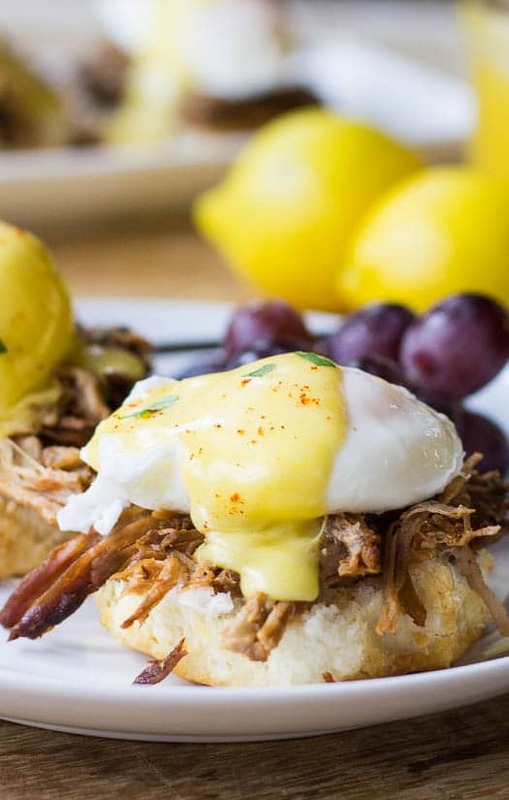 A classic recipe for Eggs Benedict with a regional (southern) twist, served on a biscuit instead of an English Muffin with pulled pork taking the place of Canadian bacon. I don’t know about you, but whenever I go out to Brunch I’m always tempted by Eggs Benedict. It has such a fancy feel to it and it’s about as perfect as a savory breakfast dish can be. Who doesn’t like a buttery, smooth hollandaise sauce dripping down over a perfectly poached egg? There are of course many variations on the traditional Eggs Benedict and I pretty much love them all. Sometimes the classic Eggs Benedict fits the bill, but most times I’ll take a biscuit over an English muffin if given the choice. Likewise for pulled pork over Canadian bacon. 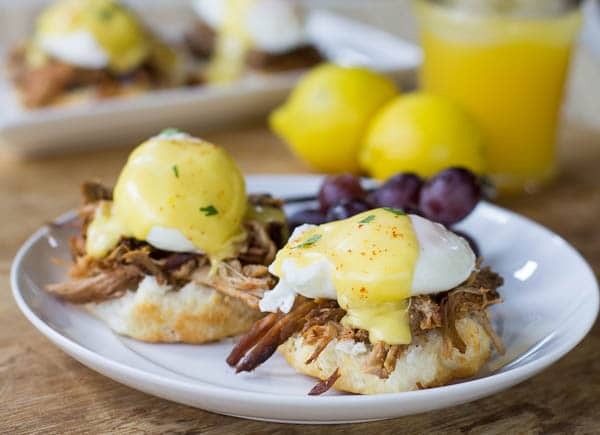 Making Eggs Benedict can be a little intimidating and tricky at home. Check out this previous post for Traditional Eggs Benedict which includes a link to a Youtube video. My 14-year-old daughter made perfect Eggs Benedict using the tips in this video. Making a hollandaise sauce takes a little patience, but it is not hard. The most important thing is to watch the heat. Let the eggs get too hot and they will scramble and you’ll have to start from scratch. 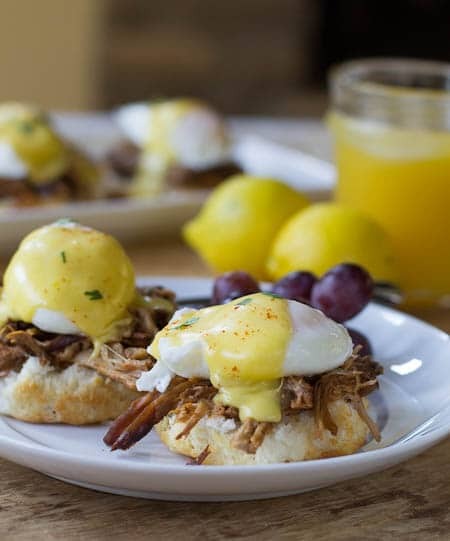 A southern twist on Eggs Benedict with pulled pork and biscuits. In a stainless steel bowl whisk the egg yolks and lemon juice until thickened and doubled in volume. Very slowly drizzle the melted butter in while continuously whisking. When all the butter has been added and the sauce is thickened and doubled in volume, remove from the heat and whisk in cayenne and salt. Keep warm until ready to serve. If sauce gets too thick before serving, add a little warm water. For each plate, split a biscuit in half. Top each biscuit half with 1/4 cup pulled pork. 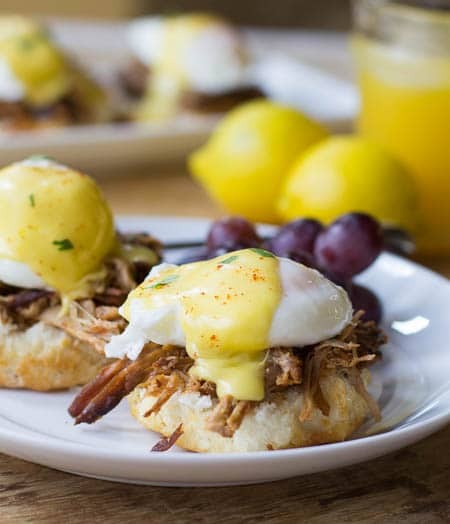 Place poached eggs on top of pork and drizzle with hollandaise sauce. 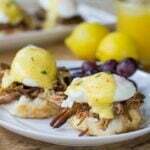 This entry was posted in Breakfast and tagged brunch, eggs, Pork, southern food, southern recipes. Bookmark the permalink. I make a southern eggs benedict as well, here is my twist on it, I cut a piece of corn bread in half and toast it in the fry pan, on top of that I place a sprinkling of cheddar cheese, a slice of country ham, cooked greens, topped with poached egg and the hollandaise sauce, a splash of hot sauce tops it off. Yummy. mmm, i didn’t think Eggs Benedict could be made more delicious than it already is, but you managed to do it! Looks so so good. It almost feels like cheating when doing an eggs benedict recipe because how could eggs benedict not be delicious! Okay, so I am that freak that doesn’t like hollandaise sauce (also, I called it holiday sauce for years…), but you are changing my mind because this looks soooo dreamy! What a breakfast! 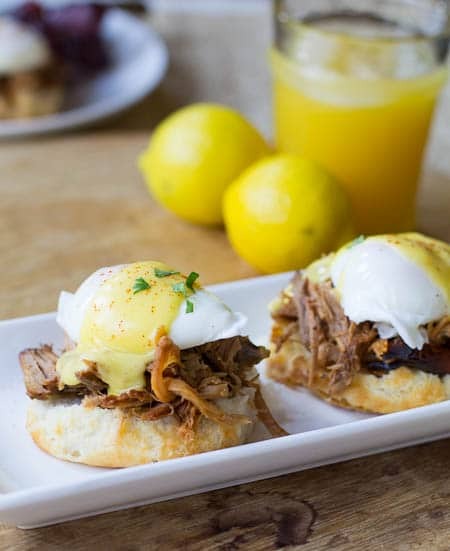 Pulled pork with eggs benedict is a fantastic idea. Oh man. This looks divine! I love eggs benedict! I want to have this for breakfast tomorrow, on Sunday! The Hollandaise sauce looks really good: so thick and creamy. Just like at the best restaurants! This is such a great idea to use pulled pork here Christin. I’ll have to try that the next time I have leftover meat. Delicious and pinned!